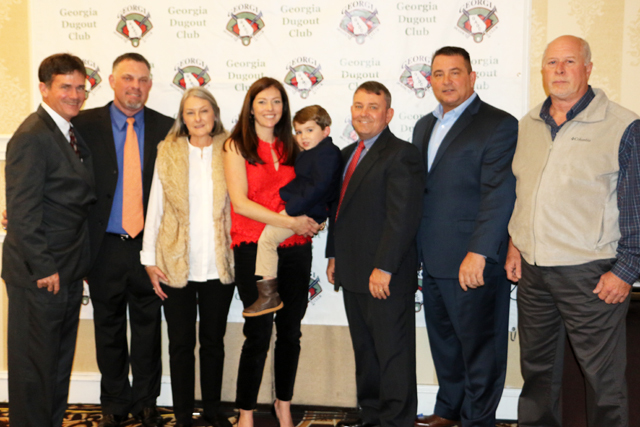 The Georgia Dugout Club inducted six new members into its Hall of Fame as part of its Class of 2018. The newest members are (l-r) Mill Creek coach Doug Jones, Parkview coach Chan Brown, Kathy Kurtz (for John Kurtz), Kauleen Thatcher (for John Kurtz), Walton coach Shane Amos, Mercer coach Craig Gibson and former Brunswick coach Charles Skipper. The Georgia Dugout Club inducted six new members to its Hall of Fame on January 12, 2018 at the Marietta Hilton Hotel. The list includes retired Brunswick High coach Charles Skipper, Mill Creek coach Doug Jones, Wallton coach Shane Amos, Parkview coach Chan Brown, Mercer University coach Craig Gibson and the late John Kurtz of Georgia College. Skipper coached in 28 seasons at Brunswick and was a longtime assistant before also serving as the school's head coach. Jones is the only coach in the history of Mill Creek baseball and has been a successful baseball and football coach. Amos has won nearly 350 games and guided Walton High School to two state baseball titles in Georgia's high Classification. Brown has led Parkview to three state baseball titles in his tenure. Two of his teams (2012 and 2015) were named national champions by several media outlets. Gibson has helped build Mercer's baseball program into an Atlantic Sun powerhouse during his tenure, while Kurtz is responsible for helping build Georgia College into a national power before passing away in 1993 at practice.